Even if your normal evening meal consists of a smoothie and a protein bar – perhaps especially then – there's a real satisfaction in cooking an old-fashioned sit-down meal. A nice pot roast or a big roast chicken is serious comfort food, especially with good gravy and homemade stuffing. Stuffing is an issue, though, if you want to cook it right in the bird. 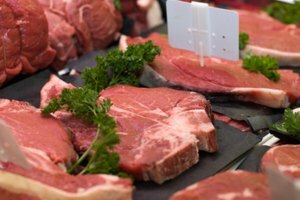 It complicates the question of food safety, so you have to do it the right way. Roasting a stuffed whole chicken is traditional, and it certainly gives the stuffing a wonderfully rich flavor. 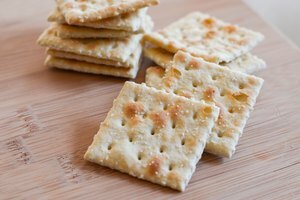 The problem with that technique comes down to a conflict between food safety and quality. 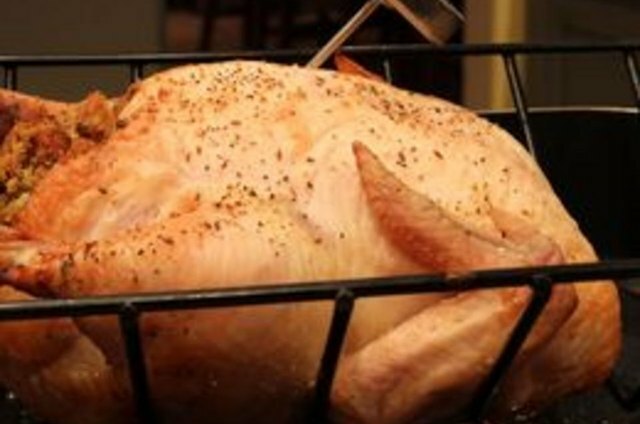 The USDA recommends cooking chicken to a temperature of at least 165 degrees Fahrenheit to ensure food safety. Your stuffing needs to reach that temperature as well, because inside the bird's body cavity it soaks up the juices from the chicken – that's where the flavor comes from – and also soaks up any bacteria that are in the chicken juices. By the time the stuffing in the bird's belly reaches that food-safe temperature, the chicken around it will cook well past that ideal 165 F.
It'll still be tasty, if you've seasoned it well, but it won't be as tender and juicy as it would have been at the lower temperature. If you want the best possible bird, cook the dressing separately. If you're okay with a more cooked chicken, and you're confident that your gravy can make up for a drier bird, by all means cook them together. There are a few simple rules to keep your stuffing as safe as possible. If you like to make your stuffing ahead of time, that's fine. Just keep the wet and dry ingredients separate until you're ready to actually roast the bird because once you've combined the wet and dry ingredients, the stuffing becomes more perishable. If your favorite stuffing includes things like oysters or sausage meat, you should cook those ahead of time. That way there's never any question of whether they've reached a food-safe temperature. Use the stuffing right away, while hot ingredients are still hot, for maximum food safety. Every time you heat and cool ingredients, there's a chance for bacteria to grow. When you stuff the bird, don't pack the cavity full. You need to leave room for the hot air to get in and circulate so both the bird and the stuffing cook evenly. 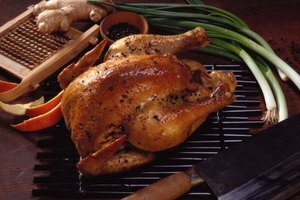 Finally, don't slow-roast your bird at a temperature any lower than 325 F. The stuffing will warm too slowly, at lower temperatures, and bacteria in your ingredients – or your chicken – would have time to create heat-stable toxins before the oven kills them. That's not a good thing. The only way to know for sure that your chicken and your stuffing have both reached a food-safe temperature is to use a thermometer. A leave-in meat thermometer is fine as long as you pull it out near the end of your chicken's cooking time and test in a couple of other places. An instant-read thermometer is usually easier, though, because it gives you a reading in seconds so you don't have to stand and wait. Use the thermometer to test your chicken in at least three spots: the thigh, the base of the wing and the thickest part of the breast. When you know for sure that your chicken is done, start testing the stuffing as well. Slide your thermometer into the dressing in two or three places to make sure all of it has reached the target temperature of 165 F.
Chicken and stuffing and gravy are all just as good the next day or the day after, but only if you handle them properly. 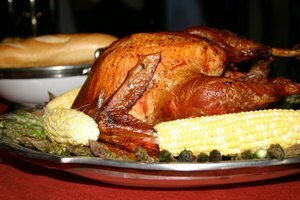 Separate the stuffing from the bird as soon as you've finished your meal, and set it aside in a shallow container to cool. You need to get it into your fridge within two hours, and sooner is better. Use or freeze the leftovers within three or four days because that's how long they'll stay food-safe in your fridge. You'll need to reheat your leftovers to the same temperature, 165 F, when you serve them again.